The Good Road Home is a book of poems and short stories by John Cardwell that delves into the interplay between place and the people and animals that live there. The book balances hard edged realism, sensitivity and good humor. It tells stories about life in Tipton County, Indiana in the heart of the rural Midwest in the 20th and 21st centuries. Through the characters in the book we learn of triumphs and tragedies, and much about ourselves. The book challenges stereotypes while expressing strong views regarding our Native American heritage, the natural environment, and how our acts as humans may affect the future. 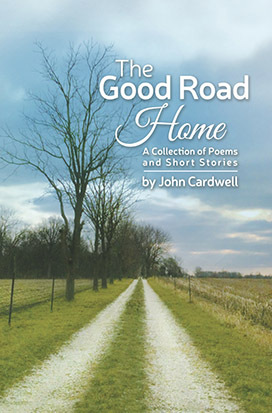 Although The Good Road Home is the first book of poems and stories to be authored by John Cardwell, its contents will hardly be a surprise to persons that know him. Since 2009, John has been writing poetry and short stories and his work has previously appeared in the Tipton Poetry Journal, Spaces to Create, and the Blue Collar Review.